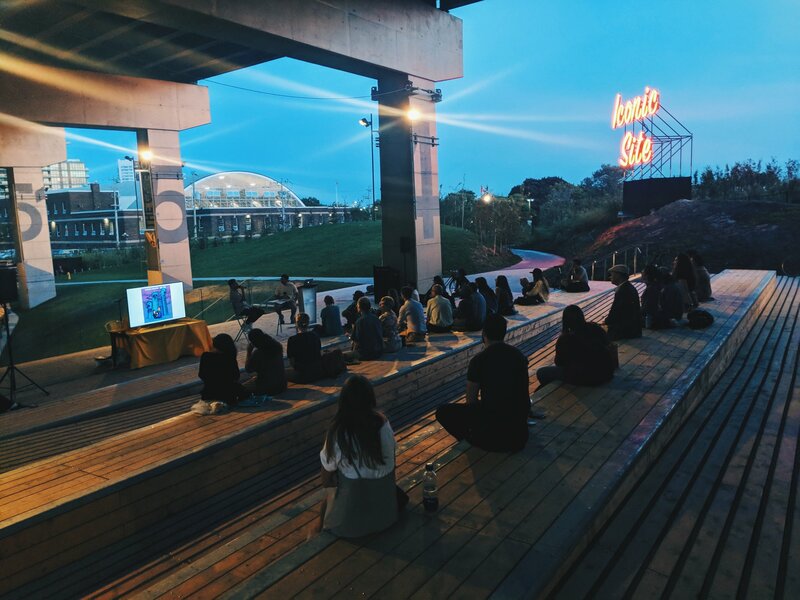 Looking back on our first evening of Central Talks on Sept. 18 with Tai Huynh, Julie Bogdanowicz, Annely Zonena, and Cadence Weapon examining vertical living. It was a calm, warm evening. 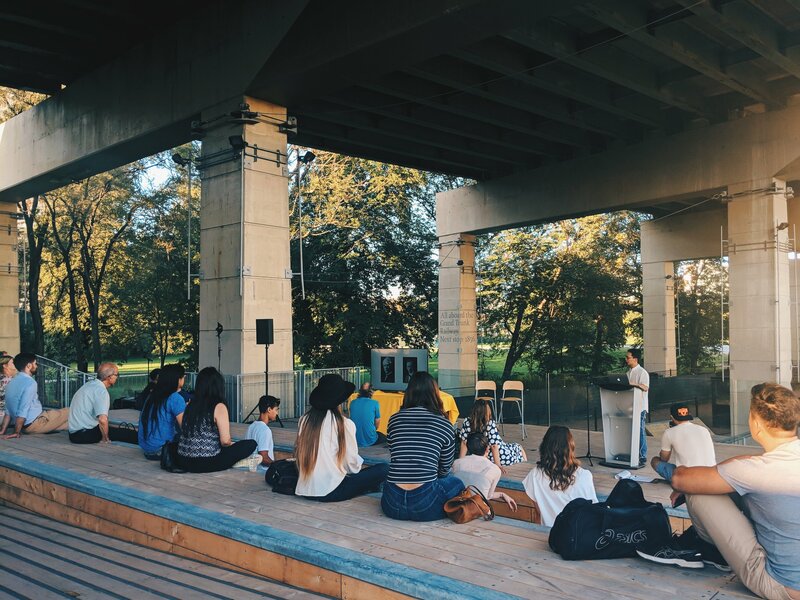 Ideal conditions for the first of three weekly evenings of Central Talks at The Bentway. In many ways, I didn’t know what to expect. Long before the event took place, I was gushing about the beautiful Strachan Gate amphitheatre. It’s a truly unique place for an event like ours. The seating was actually a treat. The wide wood benches that rise up out of the slope are nothing like the bleachers that you find at stadium. Because of the ramps that connect one side of the amphitheatre to the other, depending on where you sit, your legs might dangle or your feet might be planted firmly. You can sprawl out, kick up your legs or even lie down and have clear view of the presenter area. At the same time, you’re immersed in the city. Moreso than other areas of The Bentway, you appreciate the Gardener as the roof over your head. While it shields us from the sun and (potential) rain, you can hear the occasional truck pass overhead. The GO Train calmy rolls past on its evening schedule on the north side of Fort York. Strachan Avenue has the occasional motorcycle or siren. Our venue is open and accessible, letting all these components merge. We talked about the city while it reminds us that the day is far from over. To explore the evening’s topic, vertical communities, we brought together a writer, a rapper, and two urban planners to examine how high rise living is impacting our city and our lifestyles. Tai begins his presentation with a brief history of Toronto's high-density neighbourhoods. Tai started with a bit about Toronto’s history as a high-density city and how the citizens’ health was impacted by the conditions that they lived in. The Ward, in what is now the area near the Discovery District, was where many immigrants settled in the 1800s and early 1900s when they arrived in Toronto. Predictably, many health issues arose. There are so many stories that go deep on the root causes and ripple effects of the health of different neighbourhoods. Julie and Annely take the stage under the bents. Julie and Annely brought an in-depth report based on methodology and findings of the Growing Up: Planning For Children In New Vertical Communities study. First they focused on the paradigm shift of density downtown and the amazing number of new residential projects proposed downtown, while noting that the number of children under the age of 4 in that same area is among the lowest in Toronto. However, the number of people aged 20-34 in that same area is among the highest. There is likely to be a baby boom downtown before long. So what do these soon-to-be families need? More bedrooms. More schools. More parkland and recreational areas. Buildings should be designed with these factors in mind and units should be flexible with walls to allow families to reconfigure as new members are added. I encourage you to read the study yourself and see all the research that’s been done in these areas. It was incredible to get an overview of the work from the very people behind it. 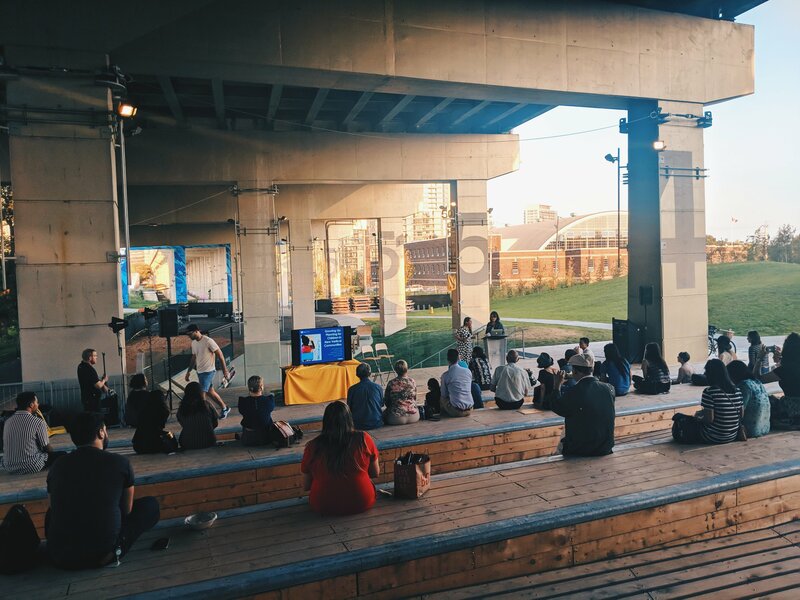 A conversation with Cadence Weapon in the twilight at The Bentway. I really enjoyed talking with Cadence Weapon aka Rollie Pemberton. His most recent, self-titled album was released in January and it’s an eclectic collection of songs that describe Rollie’s life in three Canadian cities, including his experience finding a home in Toronto. That’s the basis for the song and music video High Rise. The lyrics describes the competitive race to secure housing and a dystopian lifestyle of missed connections and mass consumption. The album art recalls a paranoid horror movie poster. He talked a bit about how the high-rise buildings don’t create a routine of interacting with your neighbours. The shops at the base of the towers often repeat the same stores over and over. He lamented the imminent loss of unique community gather points like Island Foods at the corner of King and Dufferin -- soon to be torn down to begin condo development. I’m working to summarize the events as quickly as possible - and I’ve still got the wonderful exploration of communities on Sept. 25 to do. On Oct. 2, we’ll be discussing Social Justice and barriers that exist in our city. There’s still time to RSVP for that event. See you there!